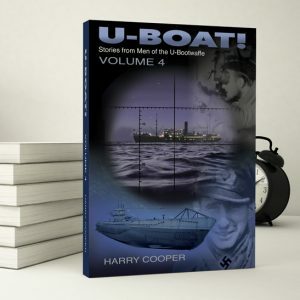 “U-BOAT!” (Volume IV) continues the fascinating saga of the German U-Bootfahrer in World War Two plus some stories from the American side. 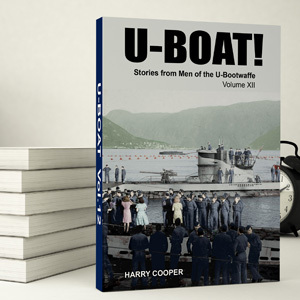 Chapter 1, ‘U-234 and her Cargo of Living Scientists’ – Dr. HEINZ SCHLICKE (1820-1991) and other scientists rode this boat in addition to the Me 262 jet fighters and more than half a ton of uranium; Japanese technicians, Naval judge and Luftwaffe Command Staff. Chapter 2, ‘A Cold Winter’s Night’ – GERARD THORNE (3407-1994) tells what it was like living in Canada during the war and goes into “Aircraft Carrier Newfoundland” as well as various Canadian Navy warships and their experiences. Chapter 3, ‘Reinhard Hardegen’ – REINHARD HARDEGEN (102-1985), the Skipper to sink the first ship in American waters as part of Operation ‘Drumbeat’ tells about this first patrol off New York and he tells about the time that USS DAHLGREN (DD 187) almost sank him on his second American patrol off Jacksonville. Chapter 4, ‘The Golden Gate‘ – A. J. TARANTINO (1496-1990) tells his experiences in the U.S. Navy in the closing moments of the Japanese phase of WW II; he tells of the “Tethered Goats” during the Okinawa campaign and much more. Chapter 5, ‘New England’s U-Boat War‘ – Lt. Col. JIM ROSE (78-1984) tells of the experiences in New England during WW II, of the sinkings right off the coast and naturally, he goes into the biggest experience of the war in that area…..the landing of the two German agents in November 1944; Abwehr Agent #146 ERICH GIMPEL (884-1988) and U. S. Navy deserter and traitor William Colepaugh. Chapter 6, ‘Monsunboote (Monsoon Boats)‘ – An excellent piece by MARCIN JEDRZJEWSKI (4477-1995) about the U-Boats in the Indian Ocean and the Pacific. 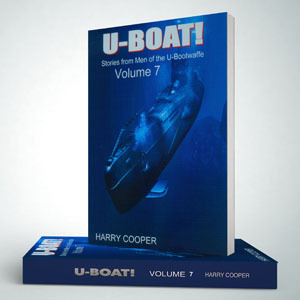 He gives in-depth reports on which boats were sent, their experiences and much more. 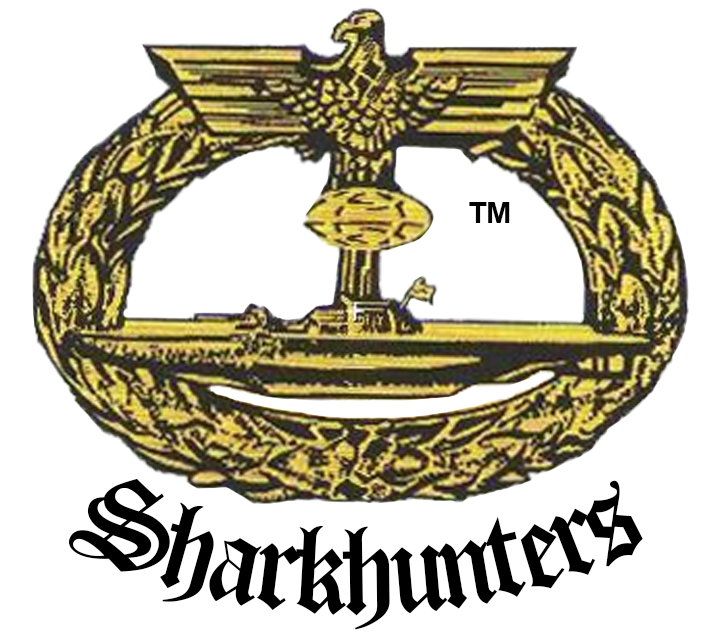 Chapter 7, ‘212 Class (the Submarine of Tomorrow)‘ – A small group of Sharkhunters Members was invited to a private seminar by one of the top engineers at Howaldt/Deutsches Werke and he gave us great information about this boat long before the first piece of steel was put in place. This AIP submarine is called ‘A Weapons System in the Run-Up to the Next Millennium‘ and it is an outstanding submarine. Chapter 8, ‘The Slender Thread‘ – WILLIAM CORR (5265-1997) goes into great depth covering the German-Japanese cooperation in World War Two, not only the communications but also talks of the rumor of babies in Macao being fattened, killed and cooked as delicacies and he quotes from George Orwell’s BBC broadcasts. Chapter 9, ‘Shelling of the Lago Refinery‘ – This is a well-known fiasco when U-156 attempted to shell the Lago Refinery on the island of Aruba. Gunnery Officer DIETRICH ALFRED von dem BORNE (38-1984) forgot to have the watertight plug removed from the deck gun and when they fired the first round, the gun exploded, killing the gunner and blowing off von dem BORNE‘s foot. 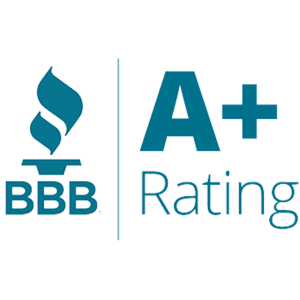 He was a Sharkhunters Member and he gave us insights into this operation you won’t find anywhere else. Chapter 10, ‘Sachsenstoltz!‘ – This means ‘Pride of Saxony‘ and SIGMUND KLAUSSNER (211-1986) tells about the Pride of Saxony; Werner Hartenstein. SIG goes into the life of Hartenstein and naturally, deeply into the LACONIA Incident. Chapter 11, ‘Gerhard Thäter‘ – Our good friend hated to be called “GERHARD” so we stick with “GERD“…….he tells us about his time in the early days of the Kriegsmarine, about his times on Feindfahrten (war patrols) and how he is one of a handful to pass through the “Gates of Hell” (Gibraltar) twice. 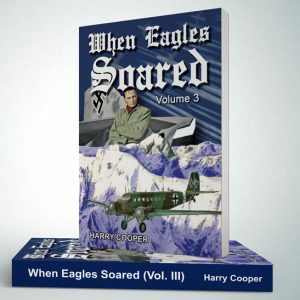 Chapter 12, ‘Midgets and Chariots‘ – The Italians who rode the ‘Miaili’ (pigs) were the toughest of the tough, and Captain J. H. I. Spier tells of their heroic combat sorties against almost certain death in the Mediterranean. Many did not return, but they sank two battleships, other warships and many merchant ships. Chapter 13, ‘Silent OTTO!‘ – What else needs to be said? OTTO KRETSCHMER (122-1985) was the top scoring submarine Skipper of any navy in World War Two and here he tells us of his wartime experiences and especially, he tells us why he and the other Skippers hated the term ‘The Happy Time‘. When you read this, you will understand that writers who use this term are really hacks and did not do their research because it really was not a happy time – only the PK (Propaganda Kompanie) used that term. Chapter 14, ‘A-17’s versus Submarines‘ – USAAF veteran BILL ROONEY (2656-1992) tells about the ASW activities of the buys based in the Caribbean as they scoured the seas for U-Boats………….and he explains that when sinking a submarine, it is a good idea not to sink your own sub!